This guide will teach you how to install Ubuntu from a bootable USB drive to be used in live mode or to run a full installation of Ubuntu operating system on your computer. As we all know, many operating systems including Ubuntu Linux comes in disk image format (.iso – archive file of an optical disk), therefore their primary mode of installation is either through a CD or DVD plates. As time goes, the use of of CD and even the modern DVDs are being gradually replaced by a more friendly and easy to use USB drives, due to their flexibility and non restrictive usage (most PCs have one CD/DVD rom with multiple USB ports). Also, this tutorial will be useful for those whose PCs does not come with a CD/DVD drive, and the only option for them to install an operating system via network. They will learn how to install Ubuntu from a bootable disk drive without relying on the use of a network connection. It is also recommended not to use a USB disk below the size of 4GB. The very first step of this tutorial is to download your preferred Ubuntu Edition from our download page. 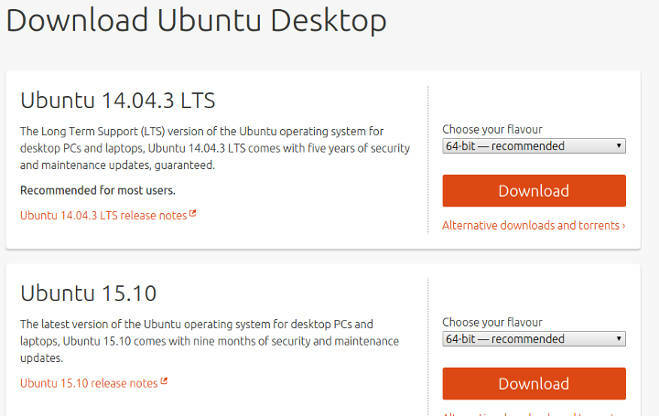 You have an option to choose between different Ubuntu Edition and also to choose between 64 bit and 32 bit versions. The recommended version as at the time of writing this article is Ubuntu 15.10 (Wily Werewolf) and the 64 bit version is recommended, except if you’re running the OS on an old model PC that does not support 64 bit. Alternatively, you can head over to the official Ubuntu Website and goto the Ubuntu download page for your preferred version. Firstly, to avoid loss or damage of your data, ensure you back up every information on the USB stick to a PC different from the one you’re going to install the Ubuntu, and you must also back up the PC itself to a different computer or an external hard drive, even if Ubuntu is going to be your secondary operating system on the computer. 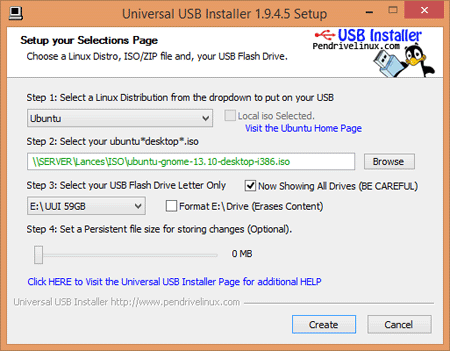 Now head over to this page to download Pendrive Linux Universal USB Installer tool. After downloading, double click on the file to run the software. Ensure no other USB device is attached to your PC before you continue with this step to avoid formating the wrong drive which might result to data loss. Select the appropriate version of the Ubuntu you downloaded in step 1 above. Browse to the .iso file downloaded by browsing to the folder and selecting the file. This is usually Downloads folder in Windows operating system. Select your USB drive letter (the size will appear at the end as seen in the screenshot above). Click on Create. Wait for it to successfully burn the .iso file to the USB stick. Finally, Ubuntu image has been burnt to your USB drive, meaning its now ready to be used in live mode or to be used to run a full installation to your computer. Now that your bootable USB drive is ready, how do you make the computer to boot from this drive? 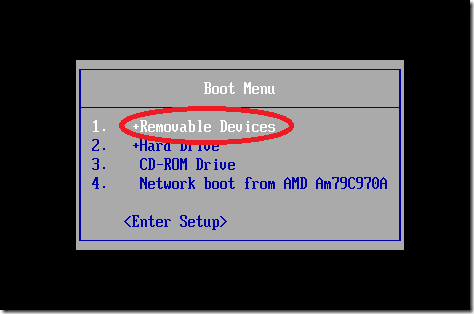 There are several ways to make a PC boot from an external device apart from the default internal hard drive, though this depends on the model of your computer, but in general, bringing the boot option is usually between the buttons F2, F5, F6, F8, or F10. So for if you don’t know which of these buttons to use, while not try them one after the other. While booting some computers, they display the button to be pressed to select a different boot device, so you can also watch out for that. While some requires you to go into he BIOS option to manually set the hierarchy for the boot devices, in this case, you have to take the removable USB drive to the top. When the boot option come up, simply select USB drive or removable disk and some computers will display the product name of the USB disk (e.g LG USB Drive). Congratulations! You have learnt how to install Ubuntu from a bootable USB drive, but it does not end here, to continue with the installation process of Ubuntu and how to manage and set up the partition, you have to read our Step by Step guide to install Ubuntu 15.10 for beginners, this guide is not just for Ubuntu 15.10, it applies to every other edition of Ubuntu with little or no difference.